Garden fresh cut dahlias are limited in July, and more selection of dahlia blooms are available August through through the end of September. Available in October depends on mother nature. Please make a your color selection, and type of flower from our catalog. Some dahlias bloom early, and others bloom later. We will do our best to provide the dahlias selected. Example: Thomas Edison doesn't bloom until later in August. To pre-order dahlias for a wedding, or any other occasion please give us a call, or email us through our contact form. If you need a floral designer we can recommend someone for you. We will deliver bulk flowers locally to the Eugene, Springfield, and surrounding areas. Minimum order for delivery must be 5 bunches or more. If you need flowers during the week, they will be available after 5 pm. Please bring a vase, bucket, or buckets for your cut flowers. We cut the dahlias in the early morning or late in the afternoon or early evening. The fresh cut dahlias will be placed in hot water with floral life. We suggest that your cut your flowers be used at least 8 hours after they have been cut. This will set the flowers, and your blooms will last from 4-6 days depending on the varieties. The dahlias will be cut when they are two thirds open for longer lasting flowers. Giant, Large dahlias which are 8-10" flowers are 5 stems per bunch. Medium, Small dahlias are 4-6" flowers, 10 stems per bunch. 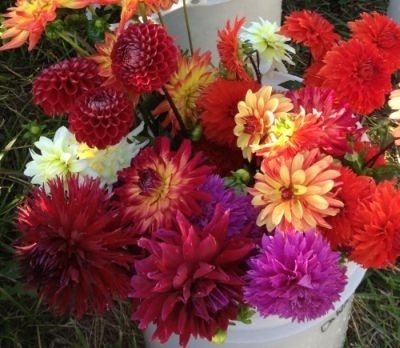 The pom, and miniature dahlias are 2-4" flower, 12 stems per bunch. The stems will be cut at least 12" or longer.